WSU Whatcom County Extension Prevention Classes! If you have prediabetes or other risk factors for type 2 diabetes, it’s time to take charge of your health. 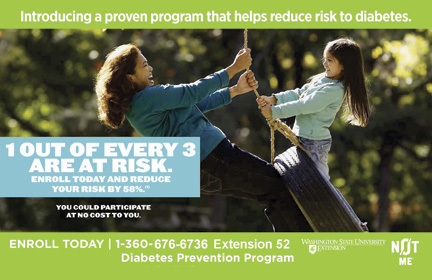 The WSU DPP lifestyle change intervention can help you make lasting changes to reduce your risk of type 2 diabetes. WSU Diabetes Prevention is part of the National Diabetes Prevention Program, led by the Centers for Disease Control and Prevention. Lifecoach Karla Anderson (360) 778-5821 can enroll you and help you change your lifestyle to prevent the onset of type 2 diabetes. The 22 week sessions in a facilitated group are fun and provide you with the support you need to say Not Me! To diabetes. Some insurance plans will cover the $430 cost for the WSU DPP. Check with your insurance provider to see if it is covered. WSU offers scholarships and payment plans for reduced fees for people with low income. One out of three American adults has prediabetes, and most of them do not know it. Having prediabetes means your blood glucose (sugar) level is higher than normal but not high enough to be diagnosed as diabetes. This raises your risk of type 2 diabetes, heart disease, and stroke. Without weight loss or moderate physical activity, many people with prediabetes will develop type 2 diabetes within 3 years. Type 2 diabetes is a serious condition that can lead to health issues such as heart attack; stroke; blindness; kidney failure; or loss of toes, feet, or legs. The lifestyle changes you make in WSU DPP will help you prevent or delay type 2 diabetes. Make a change – Start today! • Ask to be tested for prediabetes. The health care provider may do a simple blood test. • Ask the health care provider to fill out the Recommendation Form on the back of this brochure. • Take the completed form to a program near you. To find a program, call us today. If you don’t have a health care provider, call us to find out if you qualify for the program. If your score shows you are at high risk for prediabetes, talk to your health care provider or contact our program.